Come spend a day at the Museum of Ventura County! The Museum of Ventura County showcases local and regional fine art and history exhibits, which change every two to three months. The Huntsinger Gallery houses the main rotating exhibit and you may find anything from 19th century portrait art to notable comic book artist exhibits and much in between. The Museum is also home to the Smith Gallery, which houses the George Stuart Historical Figures ®, quarter-life-size figures from history dressed in elaborate period costumes. The Museum also features 3 additional exhibit spaces with regular exhibit changes where you may see exhibits like Women Sculptors of Ventura County, Skateboarding History, or the History of Bicycles. With new and exciting events happening every week, the Museum of Ventura County is a stop you cannot pass by when adventuring through the beautiful beach town of Ventura. The Museum hosts a variety of events, including lectures, panel discussions, author talks and artist gallery talks. Along with speaking events, the Museum hosts Free First Sundays, fashions shows, and figure drawing classes that can be enjoyed by all. Stop by the Museum anytime from 11-5 pm, Tuesday through Sunday. A Museum store and research library are also on the premises. Want to listen to a local musician while also gaining free admission into the Museum’s galleries? Look no further! 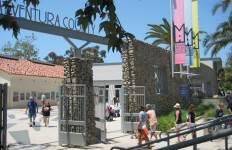 The Museum of Ventura County hosts Munch (music + lunch) every Thursday from 11:30 to 1:30 pm. Grab lunch to go at a downtown restaurant and relax with us while listening to the sweet sounds of a local Ventura musician, then take a leisurely stroll through the galleries for free. Want Family Friendly Fun? Visit the Museum on the first Sunday of every month for our Free First Sunday programming. Museum admission is free from 11 am to 5 pm. Activities alternate bimonthly with our Agriculture Museum in Santa Paula and include themed crafts and interactive fun.